I’m an admitted cheese lover. Pretty much any kind of cheese, in any kind of dish. Unfortunately I also live with a dairy allergic child so my life for the most part is cheese-free. Never one to shy away from experimenting and also wanting The Kid to experience the joy of “cheese”, I’ve played around with purchasing vegan cheeses like Daiya and Go Veggie. You’d think that dairy free cheese would be kinda weird, but surprisingly the taste is pretty spot on. That vegan parmesan is da bomb. No lie that one would pass my cheese lovers test with flying colors. Taste is pretty simple. The gooey, stretchy part not so much. You have to have animal proteins for the gooey goodness, so don’t expect any dairy free cheese to deliver on that for you. I’ve played around with a few recipes that call for vegan cheese like my mac and cheese and chipotle crema. This time I wanted to play around with a more nacho type variation so I added roasted red pepper to the mix. 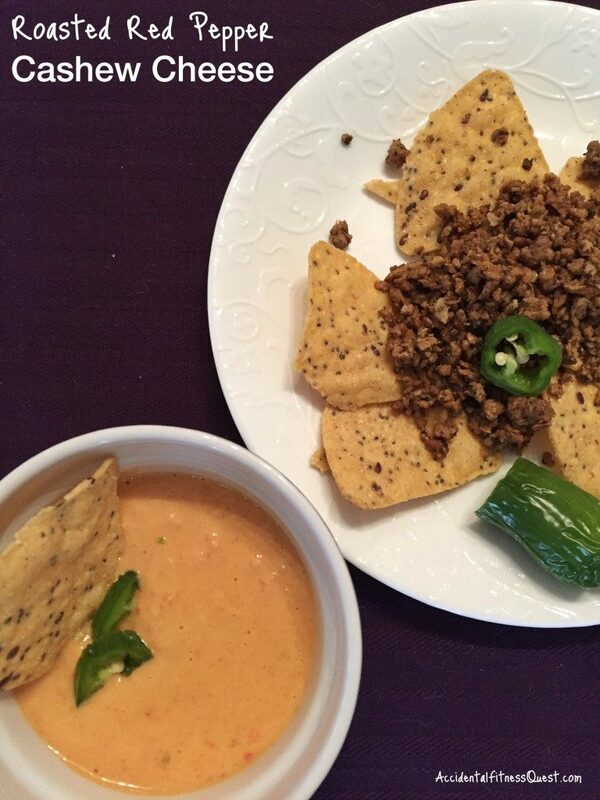 Give the cheese a try on tortilla chips with mole chili on top and you’ll be surprised. Put the cashews in a bowl or container and cover them with water. Soak them for at least 2 hours to soften or up to overnight. Once they’ve soaked, drain and discard the water. Preheat the broiler on your oven and line a cookie sheet with foil. Remove the stem and seeds from the pepper, and cut into big slices. I just quartered mine into big chunks. Broil the red pepper under the broiler until they begin to char and blacken. Remove from the oven and cool enough to handle. Add the drained cashews, red pepper, garlic, yeast and miso to a blender or food processor. Add in 1/2 cup water to start. Blend until the cheese mixture is smooth. Add just a little more water if needed to process. Makes about 1 1/2 cups of cheese at approximately 127 calories per 3 Tbsp serving – 5g protein, 11g carbs, and 7g fat. Dip veggies and chips into it. Use it in sandwiches or on burgers. Toss it with cooked pasta for a quick mac and cheese, or you could even toss zucchini noodles with it. I’ve been using it this week in my cheeseburger salads. It’s a pretty all purpose cheesy dip/spread. Now if somehow we could just get a way to make dairy free cheese gooey like would be good. Ah, a girl can dream.